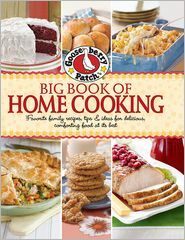 Today is the last day of the review of the Gooseberry Patch Big Book of Home Cooking. The giveaway ends tonight! So be sure to enter for that HERE. I thought I would end this review with another scrumptious recipe! Combine all ingredients except yogurt in a large bowl; stir until fruit is evenly coated. Spoon into a lightly greased 8"x8" baking pan. Sprinkle Oat Topping evenly over fruit. Bake at 350 degrees for 30-35 minutes or until apples are tender. Serve warm with yogurt, if desired (or you can really spoil them and serve it with ice cream!). Serves 9. Notes: I prepped the dry ingredients for the fruit and the topping (minus the butter) the night before, sealing them in air tight containers. Whipping it up in the morning was a breeze! I substituted canned peaches for the apples since we were out of apples. It was deeeelish! I also doubled the recipe for my crew and baked it in a 9x13 dish! Recipe said that it served 9 but I knew my hungry crew of 7 would be wanting more. Glad I did. The dish was empty in minutes!